It doesn't feel right (as someone who is not British) to say Happy Boxing Day since we don't have it as an official holiday here in the US. However there is something very appealing about having Dec. 26 as an actual holiday. Because after all, it is a holiday in just about everyone's mind - whether we have to go to work or not. I'm doing some serious lounging with a few bursts of tidying up. I gave the sewing room a good vacuuming, it's amazing how much dust and fuzz settles in every corner of a sewing space. The past few days I have had a couple of new blog posts on the Craftsy sewing blog which I think might be useful to a lot of people so here are the links. Also there is a page listed above where I have links to every one of my Craftsy blog posts, subdivided into categories. 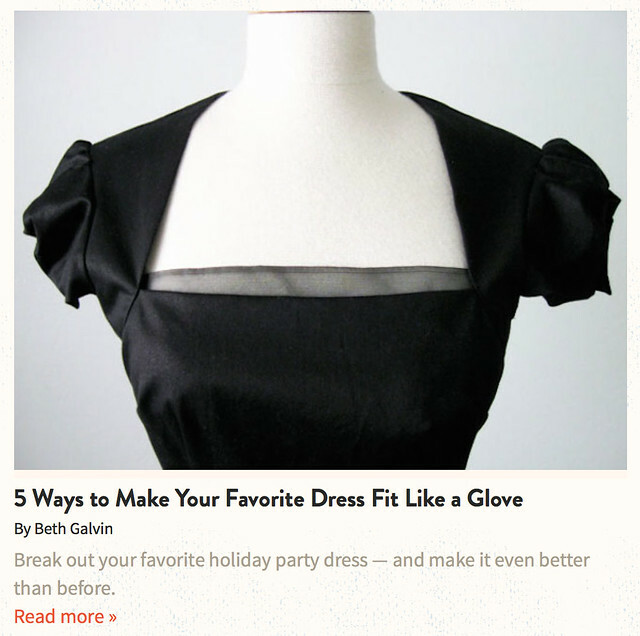 Next is my take on adjusting an existing dress. Sometimes you have a dress that just doesn't fit right or is not comfortable due to the fit. 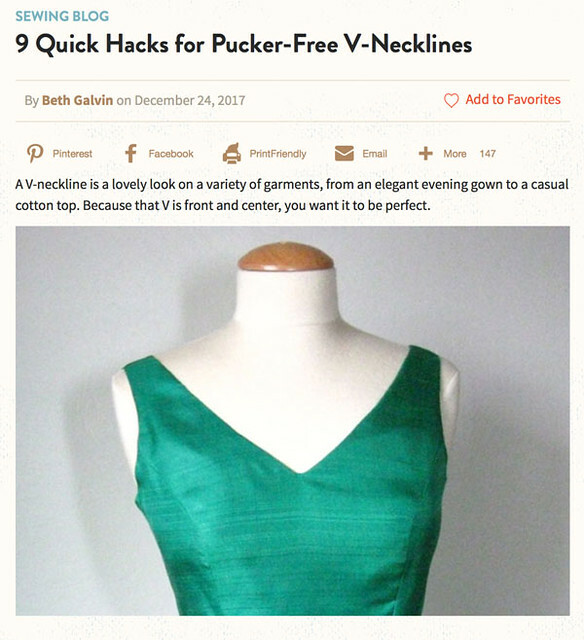 Check out my tips on adjusting the dresses you already have in your closet. Next up in my sewing is finishing a bunch of items that are in progress. Yet what I feel like doing is curling up on the couch and watching a movie. I think so. This is the time of year to relax and indulge. I'll be back soon with an year-end analysis of my sewing, which I like to do mostly for me, to see how what I sewed compares to what I actually planned to sew😉. Happy Holidays and enjoy the leftovers - I know we are! It's the most wonderful time of the year. At least that's what the song says. Some days are more wonderful than others...today was some last minute shopping (the lines, the traffic, the people coughing right behind me, eek!) so after that I scurried home and decided to catch up on my blogging. I had plans to take some festive photos as I did last year near the big Christmas tree but that didn't work out, so we have some more backyard pictures. I have a lot of other projects in the works so hope to do some better photos of those soon. Meanwhile - I used my Burda magazine subscription. I am so proud of myself. Admittedly a very minor achievement but I've already seen several things to make in the issues that have arrived. And there are a couple of super cute jackets in this issue with interesting sleeves so maybe I will get to those before the winter ends. 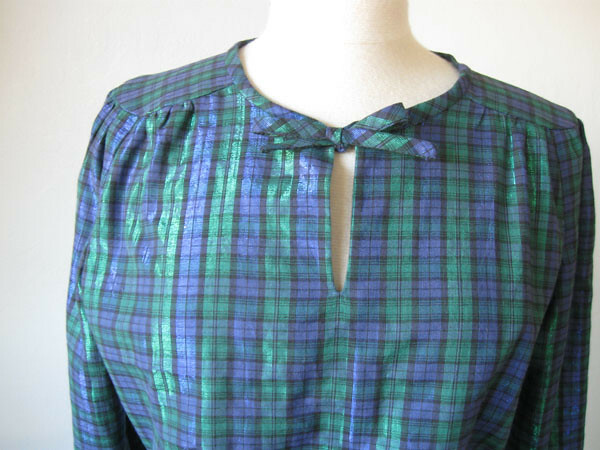 The outdoor photos don't show the true nature of this fabric which is not only plaid but sparkle. I guess it a lurex thread woven it, and it doesn't show except when the light hits it in certain ways, which is kind of nice. I bought it at a sewing guild sale for a few bucks, maybe sometime in 2016 and thought this just might make a festive type of item. And promptly forgot about it until a few weeks ago when I was rummaging around for something else and came across it. 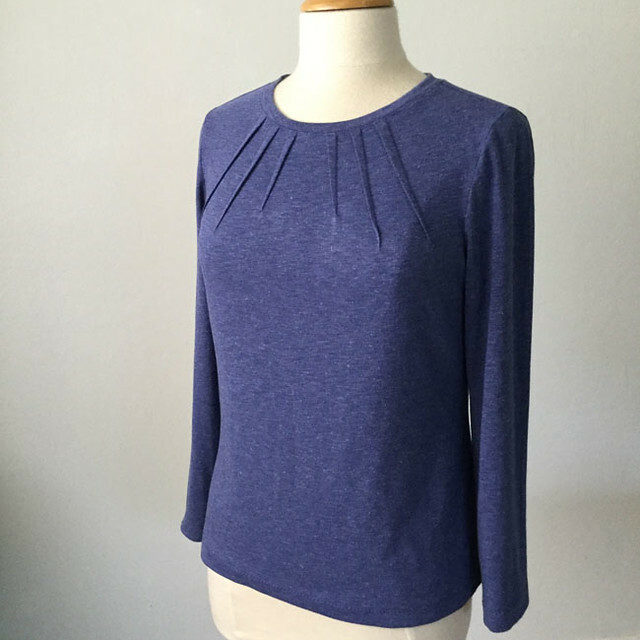 There was just enough to make the Burda top. I've been trying to sew new shapes and silhouettes so this seemed like a good one to try. Here's the magazine photo and tech drawing. It's also a dress and their view shows the elastic at the waist. More on that in a minute. I did add the elastic as the pattern intended, tried it on, and realized that it would drive me crazy. 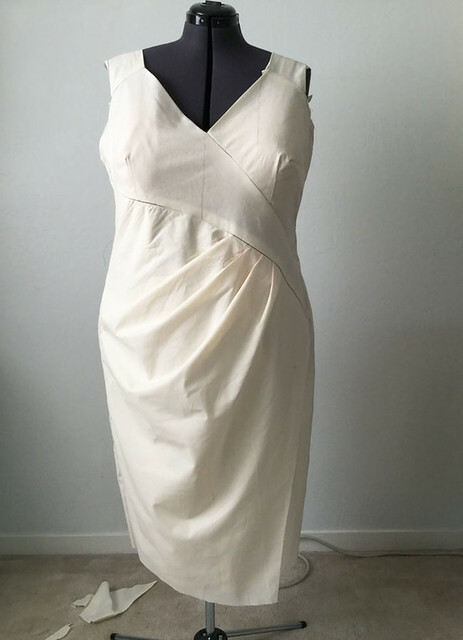 For one thing my fabric is probably a bit too stiff for that type of style, it needs a much softer fabric like a rayon woven or a silk crepe would be best. Also the bottom portion is really wide, it adds a lot of volume. Let me tell you that when I had it on the elastic gathered section landed at my waist, and the bottom part wanted to stick out like a ballet tutu. Slight exaggeration but definitely that was the resemblance. I think in a dress it would work better as the weight of the skirt would pull down that part more than a top. It looks sort of OK on the dress form but on me it was weird. Maybe I made the elastic too tight and so when I lifted up my arms the gathered part stayed up too high on the torso. And looked goofy. But I was really happy with the color and the shimmer so I just removed the elastic thread stitching. 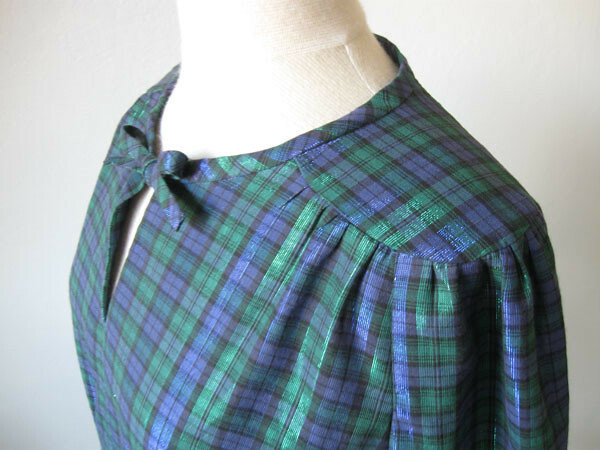 Here's a look at the shoulder detail, it has oval sections that extend over the shoulders and then the sleeves, front and back are attached to those sections. And I see some neckline stay stitching there in this photo near the bias binding, which I have since removed. Sometimes when you stay stitch a neckline the stitching wobbles a bit when you attach the facing or binding, I just try to attach the binding evenly and then remove any stray bits of stay stitching after it's finished. I didn't use the pattern piece for the neck binding as I had to piece it together which whatever scraps of bias cut I could find after cutting out the larger pieces. So the tie ends are not too long but I kind of like the little bow. Just to show you how shimmery this fabric really is, an indoor photo with the flash. In the photo above where the top still has the elastic, there are some green pants pinned to the dress form, which I just sewed and will get their own blog post as I have lots to say. I made my own jeans pattern, yay! And sewed them up in this stretchy ponte which was kind of a random purchase but I think I need them in other colors now. I made a pattern from an existing pair I have in order to practice for my class last month (Pattern Drafting - Copying Ready to Wear February session) and they came out better than I could have imagined. Lots of details to come on those. Also that class is scheduled again at Hello Stitch for February so if you have wanted to try that sign up on the link. 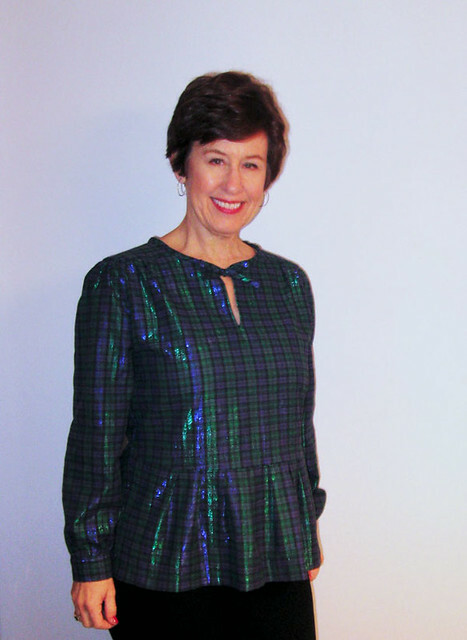 That's it for my sparkly holiday blouse, which I will be wearing this weekend to hang out with family and friends. After all the baking, cooking, wrapping etc. is completed. And then we open a nice bottle of wine and have our Dungeness crab (Christmas eve traditional meal). 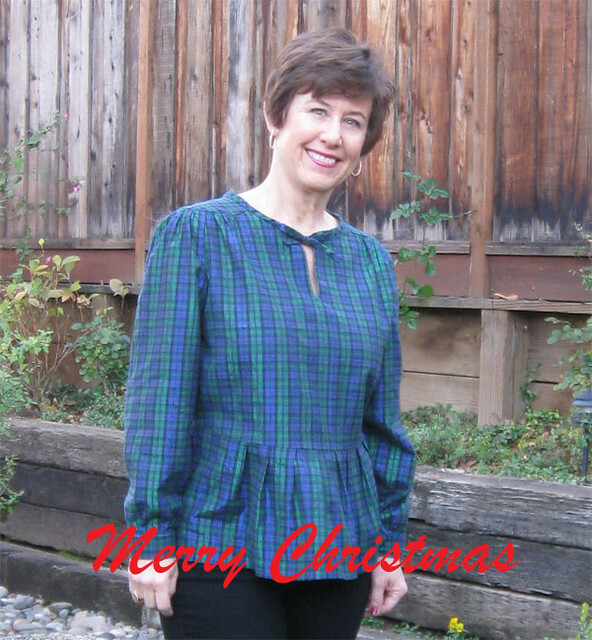 I'll be back with more blog posts before the end of the year, including a sewing year in review. Which means a few finished things like this trio of knit tops. All made using patterns that I think are just perfection. 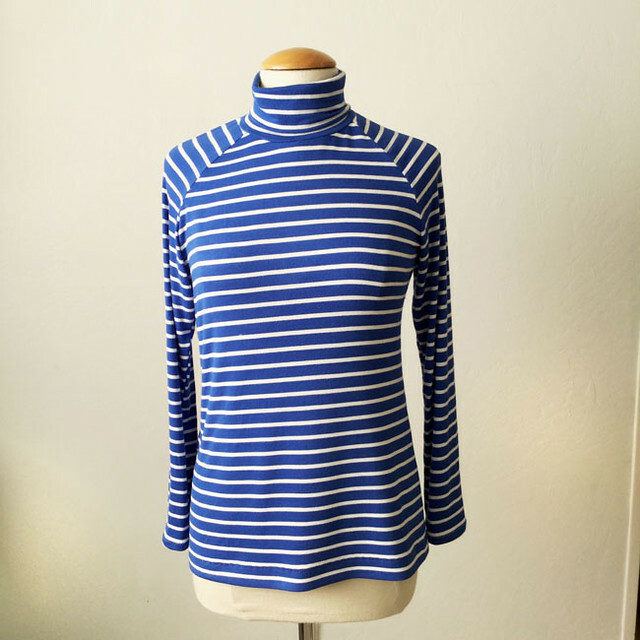 First up this Vogue pattern 9205 which I made previously in a stripe knit. This is a very soft rayon knit found in the upstairs section at Stone Mountain (where else, right?). And every time I do a knit top class at Hello Stitch Studio I seem to make a knit top for demonstration purposes plus I use up the scraps of various knits I have stashed around. 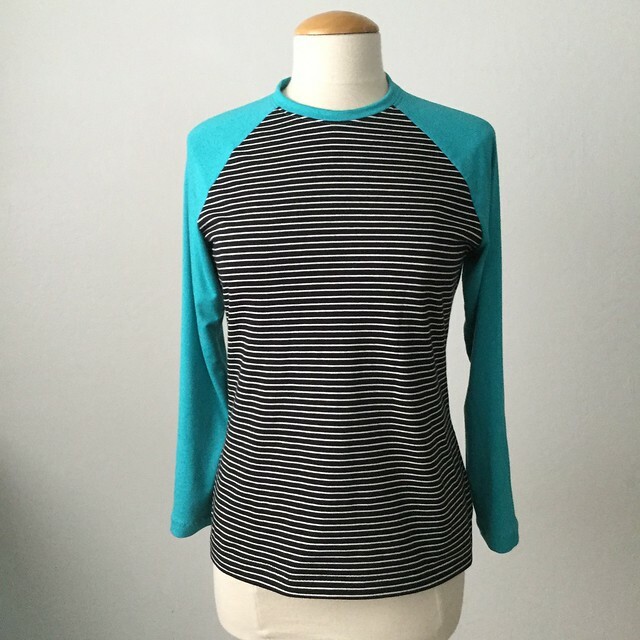 So one more version of the Burda raglan. Ok now for the more interesting things. 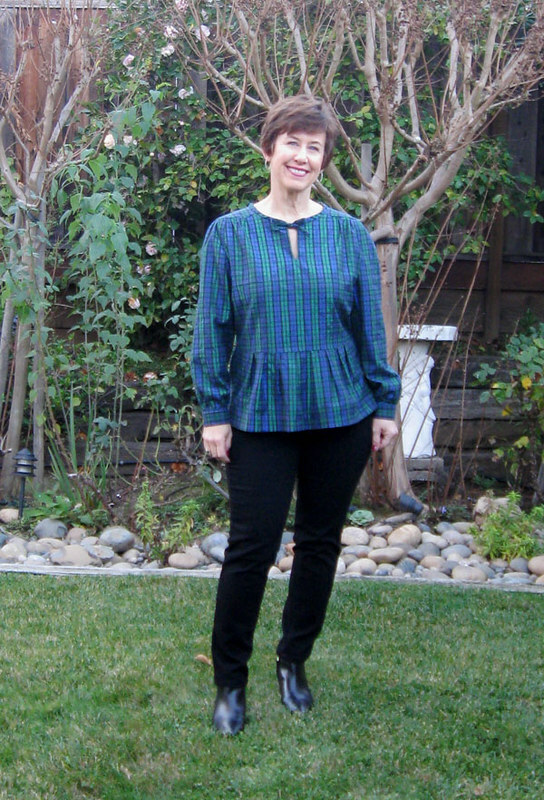 Green jeans. 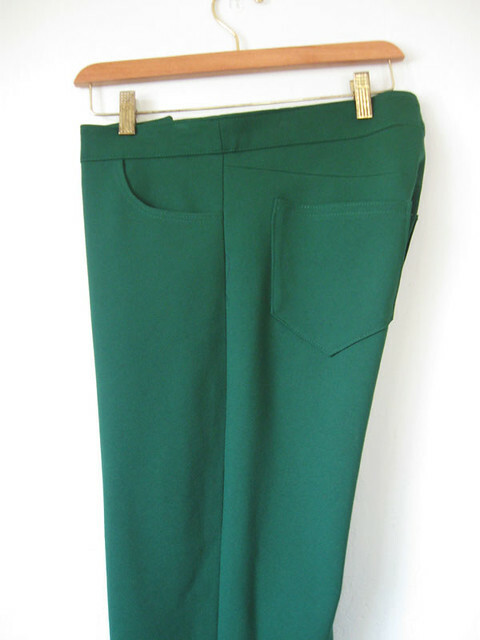 yes, green jeans but they are far more interesting than might appear. And as you can see not finished. A theme right now, lots of unfinished stuff. However these jeans are the result of using a pair of my jeans that fit perfectly and making a pattern from the jeans. 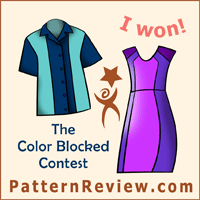 I just taught that class so prior to that I was in a frenzy of copying, with jeans being the ultimate prize, so to speak, in the pattern copy sweepstakes. I have cracked the code on these and one tip is to use as close to the original fabric to ge the same fit. Lots more details and photos once I get these finished. A Hemisferic Coat from Pauline Alice Patterns. Oh you didn't think I was going to let that one pass by, did you? You know how I love her designs. This is actually going to be for my friend Heather's daughter, and Saturday we are off to find the perfect wool. Thinking merlot color or something like that. 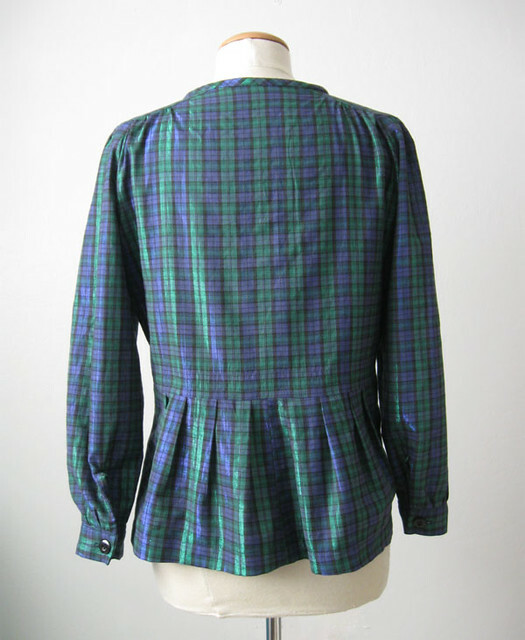 Also I am changing it from zipper front to a hidden buttonhole placket. I just don't like zipper front coats, to me they seem too casual. And something for Heather, as she has a party in early 2018 so I am giving myself plenty of time to get this one going. 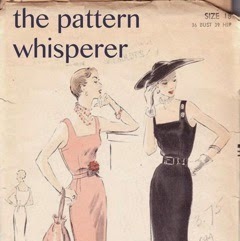 The moment I saw this pattern on the Burda website I wanted to sew it. 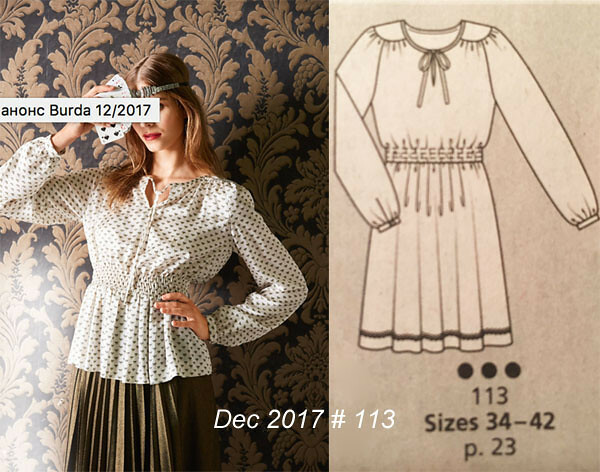 It is Burda 07/2017 # 124A and I haven't seen any reviews but I think it is gorgeous. I probably will add some sleeves, either cap sleeves or maybe 3/4 sleeves. We will see how it goes. But that seaming, gorgeous! For myself I have two projects in the works and I really want to get to both of them but I have no idea when I will do so. 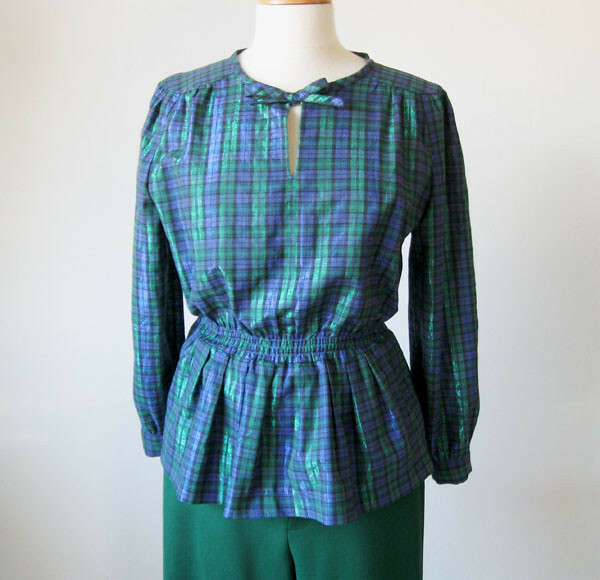 The first is this silk crepe de chine blouse I started before Thanksgiving, with the idea of making it before I did the wool jacket. And here it is, waiting for me to get back to it. 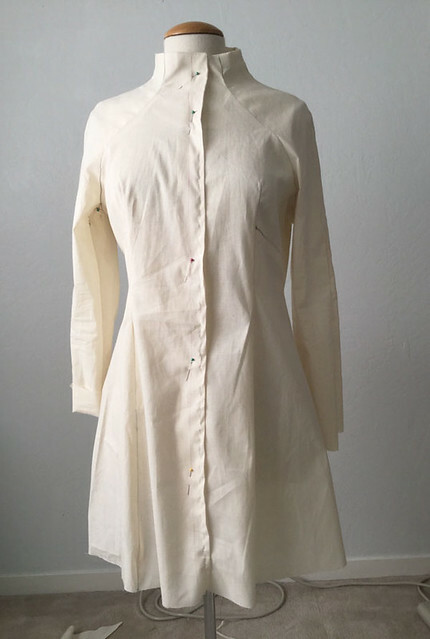 It is going to be a longish shirt, and then the jacket will be kind of cropped, but use both sides of the wool which is on the hanger behind it (note tiny squares on one side and bigger squares on the other). 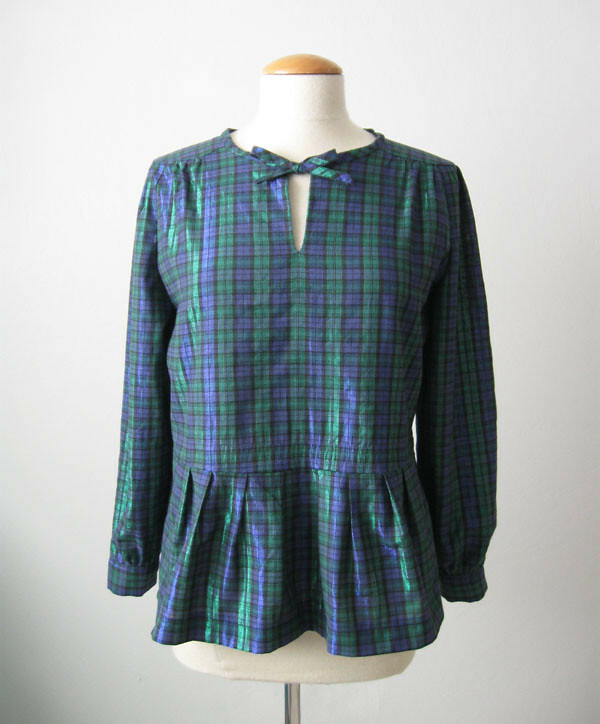 I bought this at Mood last October and I really want to sew it up for this winter. Soon! Also I have just enough silk to make a long tie bow which will be separate so I can wear it with or without. Well that's the latest around here - so much stuff in progress and a lot of wishing for more time to finish. They have posted some of Hello Stitch Studio classes for January and February classes on the website so if you are in the area check it out. 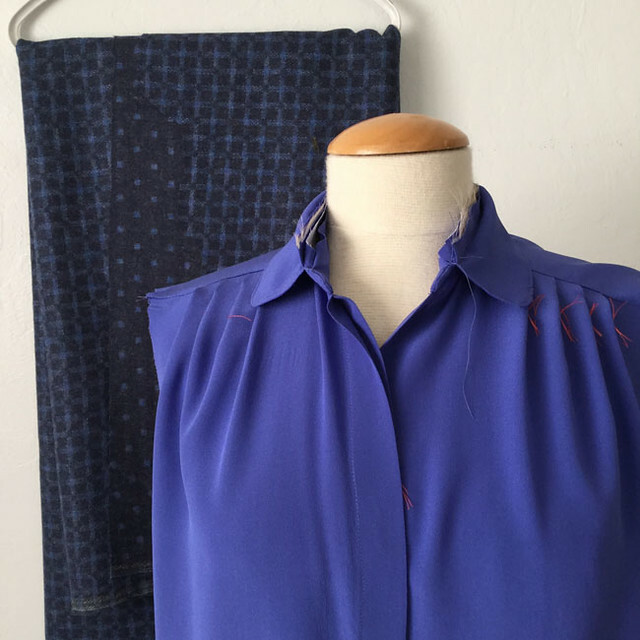 We have the Knit T-shirt and Button Front shirt classes again, plus some new ones including Pattern Basics - How to Read Sewing Patterns. I think that one will be really useful for a lot of people whether you are a beginner or as a refresher returning to sewing. And everyone will bring a couple of patterns so we can discuss specific examples. Here's today's garden photo. 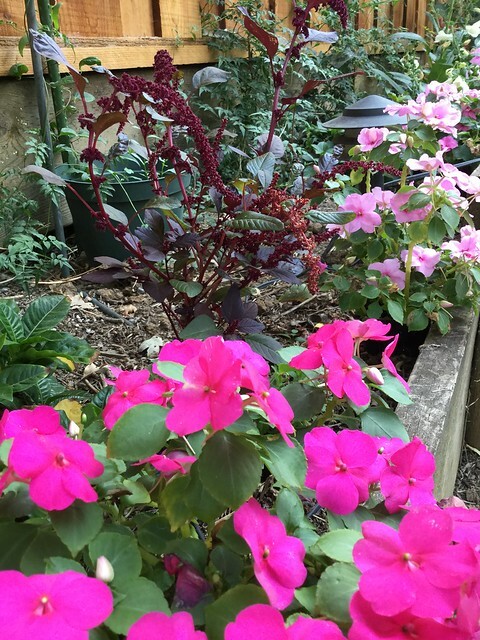 Despite the chilly weather we haven't had frost so my impatiens are still blooming. And this burgundy color plant with lots of little seeds has thrived. I can't remember the name, it is a type of grain but this is an ornamental version. I hope it reseeds for next year.